Some take big all at once, but others take just a little over a long period — the latter can continue with few noticing and nobody able to stop it. 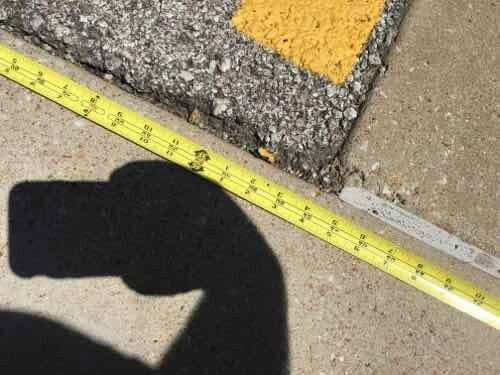 Seven years ago I posted about theft of public property, see Stealing a Sidewalk (images since lost). Since then nothing has changed. 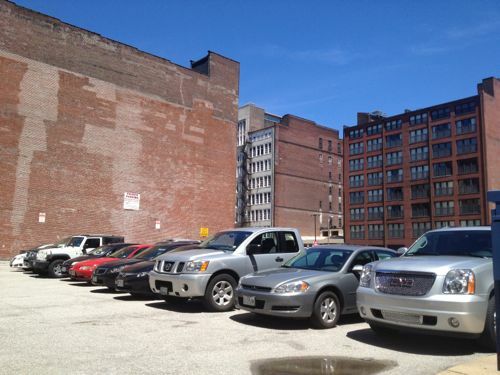 Much of city block 823 bounded by 11th, Locust, Tucker, & St. Charles, is surface parking. Miss Hullings Cafeteria was located on the NW corner of 11th & Locust for decades. Looking West we can see how the sidewalk doesn’t relate to the building line next door. It’s very obvious in person and pictures. You might be thinking the legal property lines are different than the adjacent properties to the North & West. Typically the Public Right-Of-Way (PROW) doesn’t narrow suddenly by more than 3 feet. I know from a Sanborn Fire Insurance map the line was straight in February 1909 (see for yourself). As we know, the city has been vacating streets & alleys for decades — perhaps this was changed when nobody was looking? So last week I went down to city hall to look at the official plat records. 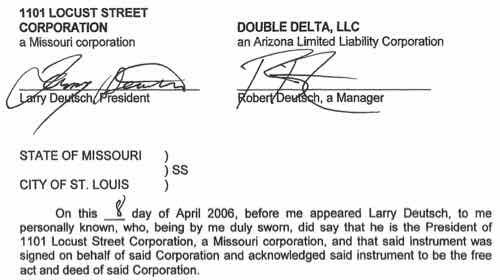 The owner is Double Delta Arizona LLC. This Missouri LLC was created in July 2009 by Larry Deutsch, 14 Wydown Terrace in Clayton, MO. It is to register a foreign (non-Missouri) entity of the same name, but located in Arizona and created on October 27, 1993. 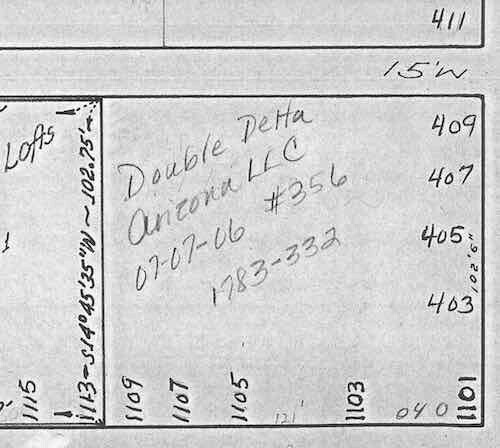 A search of the Arizona Corporation Commission confirms that Double Delta Arizona LLC was formed on that date. The current agent is Michael Benjamin Deutsch, 33 Oakwood Hills, Chandler AZ. Maricopa County Assessor’s records show the owners as Michael & Jill Deutsch. Double Delta Arizona LLC is a property management company located at 2130 West Chandler Boulevard, Chandler, AZ. Chandler is a suburb of Phoenix. Back in our city hall, I stopped by the Recorder of Deeds office to look up public records on 1101 Locust. The most recent was from April 2006, a Quit Claim Deed (Wikipedia) to transfer ownership. The 1101 Locust Street Corporation was created in June 1993, dissolved in November 2007. What I don’t know is if the PROW was reduced deliberately or accidentally. The Deutsch family acknowledge they’ve been using part of the PROW for years. The Deutsch family pay the city for the cost to a) remove asphalt and pour additional concrete or b) pour new sidewalks up to the legal property line. The Deutsch family update the surface parking lot to the city’s current parking lot standards. including physical separation (fencing, landscaping) between private & public property. The city remove/reduce the existing curb cuts, requiring access via the alley on the North side of the property. Some of you might be thinking this is not big deal — a sidewalk still exists. Yes and no. At the drives there is basically zero ADA-compliant sidewalk width. Zero. This is a pain for many besides myself — families with a baby stroller, for example. This is yet another example of the awful pedestrian experience in St. Louis. The problem has been identified, now it should be corrected! Wow, kudos to you for all the research done on this issue. I would find it interesting to learn if anyone in the Deutsch organization bothered to prepare a site improvement plan and then apply for a surface lot building permit when this lot was first developed, which would have shown property lines, elevations, parking spaces, curb cuts, among other things. Such a site plan clearly would have shown any sidewalk encroachment, which immediately would have alerted plan reviewers that there was some shady, quiet one-way partnership arrangement with the city being proposed. So one would conclude that 1) either a site improvement plan wasn’t prepared and a permit wasn’t applied for and granted, in which case the asphalt truck probably showed up on site one sunny day and dumped its contents; or 2) that the site plan was prepared but was intentionally or unintentionally inaccurate, which is unlikely IF it was properly sealed by an engineer or architect, as required ; 2A) the city failed to conduct a final inspection and issue an occupancy permit, at which time the sidewalk reduction would have been obvious; or 3) The plan reviewer’s wife has been allowed to park free on the lot for the past 18 years; or 4) the plan reviewer had recently earned his associate degree in underwater basket-weaving and couldn’t find employment outside the walls of city hall, and just happened to be a step-nephew of one of the reigning aldermen. If permitting was skipped, it’s not too late for the City to meet with the Deutsch organization, insist on compliance, or condemn the lot and shut it down, then fine them for the original permitting costs plus penalties, then charge them the $135,000.00 lease payment earned during the partnership period, plus interest. This would actually happen in other cities in the US, but probably not in STL because of prevailing entangling political alliances which have threatened the city’s health over the past half-decade+. It would be interesting to learn how many parking lots in the city just sort of “evolved” over the years. Another example: the lot located on the south-east corner of 20th and Washington. try: over the past half-century+. Many times non-structural flatwork does not require a permit. This is from the County, but I’m assuming that the City has similar requirements: http://www.stlouisco.com/Portals/8/docs/document%20library/public%20works/code%20enforcement/permits/when-req/LD-Comm.pdf . . and items 12-15: http://www.stlouisco.com/Portals/8/docs/Document%20Library/Public%20Works/code%20enforcement/permits/when-req/bldg-comm.pdf . . Who knows what was required (or not) 50 years ago (probably just permits for demolition and curb cuts), and everything since has been “maintenance” . . . Bigger picture, if you want to go down this road, lets go after all the restaurants and bars that appropriate a portion of the public sidewalk for outside dining and the impacts created by food trucks. It doesn’t matter if it’s a vehicle or a table, it’s still blocking the sidewalk or parking and generating revenues for a private business by using the public right-of-way! You can’t have it both ways, being selectively outraged at certain activities, and willing to let other activities slide IF your goal is to provide clear pedestrian access on every sidewalk! I really don’t have a dog in the hunt beyond a professional one. But I can’t imagine that in the late 1990s, a site improvement permit wouldn’t have been required–if for no other reason, just to assure that the proper grades were maintained to provide for water run-off and minimize bird baths, especially challenging during the hard-freeze months in STL, and necessary to control mosquito breeding in the Spring. 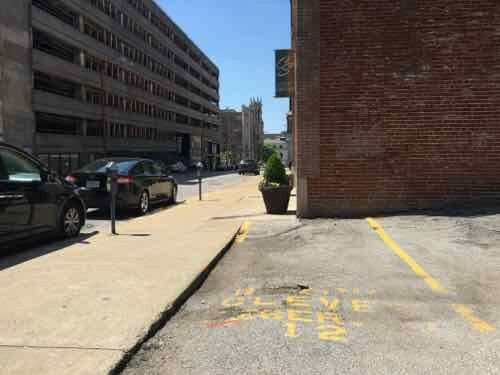 (The Hullings “improvement” was made +/- 20 years ago–and the requirement for permitting in STL hasn’t changed much in that time frame, although design demands on the developer have increased .) I have never worked in a jurisdiction where non-structural flatwork construction didn’t require a permit based on an engineered drawing–especially where public use was anticipated. Permits were required in the 80’s even for sidewalk improvements. Even before the City adopted their parking lot improvement regulations (storm water management, perimeter curbing, lighting, ADA access, landscaping, lighting, fencing), engineered parking development would have been critical just to shift responsibility away from the governing jurisdiction in the event of an accident claim. Even minimum parking space width and minimum drive lane dimensions/distances were on the books 30 years ago, and they applied to both surface and garage parking. How could these regulations have been monitored without an accurate, engineered drawing? My comment did not exclude restaurant/bar encroachment on public sidewalks. It is my opinion that the City should enforce those encroachment codes as well. Period. I have always had a problem with food trucks. Not only do they block the streets and sidewalks, but they tend to unfairly compete with nearby brick and mortar restaurants, offering an unfair advantage to the guy whose major expense is a tank of gas and a minimal vehicle investment, vs the expense of owning, staffing, and maintaining a brick and mortar establishment. At a time, especially in downtown STL, when the City is trying to attract and keep restaurants, it seems absurd to me that food trucks would be tolerated. Or if tolerated…..then regulated to even the playing field! (Steve did a blog on this a few years ago, and based on reader comments, I know my opinion is in the minority.) It’s survival of the fittest–free market capitalism–I KNOW– but the skin of even the last hog in the wallow will dry up, crack and progress to skin surface infection and the hog will eventually die if there isn’t any rain to fill the wallow or if the farmer fails to add water! As I know you’re aware, parking lot design should be more than unloading a few trucks of asphalt and then smoothing it out. Look around STL downtown and that point will be made clear. I make my living by providing a service that provides clients with a confidence that their building (or parking lot) will be safe to occupy, and why should I be eliminated from the process any more than an architect would be eliminated from engaging in a safe design for even a minimal upgrade that would affect egress or circulation? Owners are not always capable of making good design decisions, despite their otherwise good intentions. Not saying that you should be excluded from the process, but government walks a fine line between protecting the public’s health, safety and welfare and private property rights. Once a surface lot is paved, as long as it is maintained, government’s role usually is (and should be) minimal. I agree completely. I was referring to the initial parking lot construction that happened right after the Hullings Building was taken down. That was the time when engineered parking lot drawings should have been prepared, permits purchased, followed by an occupancy (use) permit. 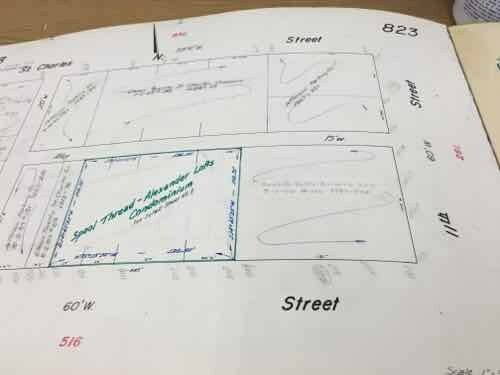 Survey marks, property lines, easements and city sidewalks would clearly have been shown on the drawing, and the sidewalk encroachment condition would (likely) never have existed. Routine maintenance obviously doesn’t require any engineering or permitting, but if the current lot owner today wanted to upgrade the existing lot to include the City’s current surface lot standards (lighting, curbs, ADA, landscaping, fencing, storm water management, etc), engineering would be necessary and a permit would have to be pulled. What likely happened when the Hullings Bldg came down is that the demo contractor removed the building, then backfilled the excavation, then the owner called in an asphalt company to spread enough asphalt on the parcel for parking, rather than seed/sod the parcel and have it sit idle and collect trash. Sidewalk cafes *should* adhere to a set of specific rules & regulations, the first of which defines where one can be and how large it can be, based on maintaining a continuos 6′ of right of way. Through cursory research, I haven’t been able to find detailed rules and regulations. Chicago, on the other hand, has that info front and center on its Dept. of Business Affairs website. It’s a *very* detailed, multi-page pamphlet. In that case, a business (or the approving alderman/council) has no excuse or recourse for acting outside the bounds of those regulations. In STL, the poorly-defined regs are a detriment. As if this illegal encroachment on the public right-of-way isn’t enough, cars are often parked on the sidewalk as well. And after a snowstorm, snow is typically plowed onto the sidewalk, completely blocking it. After all, preserving parking spaces is more important than inconveniencing a few pedestrians. This is the kind of stuff that makes it difficult to create the kind of downtown environment where people want to live and work…cars parked on the sidewalk…uncovered and overflowing dumpsters on public streets. Someone at the Downtown Partnership or City Hall needs to pay attention. I think you are exactly right it “makes it difficult to create the kind of downtown environment where people want to live and work.” Steve’s more recent post magnifies that disregard further. And when you include the sheer number of surface parking lots and how they are randomly placed it is clear there is no value put on the pedestrian experience. It makes me think City Hall needs to do more than pay attention. The whole way business is conducted is questionable. Look at Paul McKee proposing several autocentric developments on the Northside. Does this mean his vision for the Northside is autocentric development? Has the public been informed? All of these decisions, or the lack of them, impact the desirability of St. Louis for both residents and visitors. Yeah St Louis is a hot mess. You and Les Sterman are right. 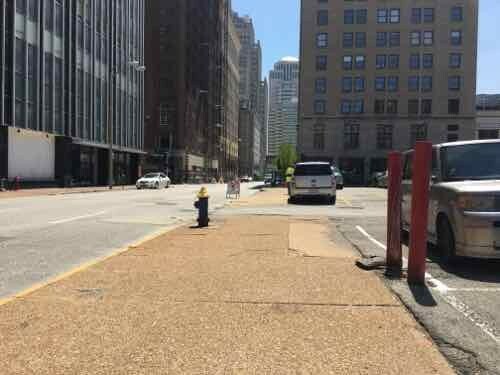 The surface lots do nothing to enhance the pedestrian experience in downtown STL. But those parking lots will be difficult and costly to build out in the future because odds are that footings, piers and foundation walls were removed only minimally below grade but will have to be removed entirely before a new structure can be built. Based on the photos of the lot at 1601 Locust, the pavement settlement patterns and surface-failure patterns tend to point to the subsurface presence of rigid concrete footings/walls with fields of poorly compacted soil fields placed between the walls, likely mixed with concrete rubble too large to be considered suitable/densely-placed backfill. The City didn’t used to be too diligent about monitoring demo contractors when they backfilled their excavations. Now they’re much tougher! So to prepare the site for new foundations for a possible new building, all the rigid concrete footings and walls and all the soil backfill mixed with broken concrete will have to be removed and hauled off, and then soil will have to be imported and placed in engineered lifts in order to achieve necessary compaction levels. That adds a huge hunk of change to the redevelopment budget. The lot at the SE corner of 20th and Washington is similar. Even the grassy empty lot immediately south of Sporting News Lofts has similar issues.There, you can locate the foundation walls in the hot summer months just by looking at where the grass covering the shallow concrete walls is brown, vs in areas where there is no shallow concrete where the grass is green(er). You’re right. (Some of) STL is a mess. I know what you mean, I’ve seen a fair number of problems with old foundations over the years, including drilling piers to get below the rubble and casting beams to carry the new foundation. Trouble is, unless City Officials somehow catch a clue on how and why they are making St. Louis less desirable and attractive few of these vacant lots will be ever be redeveloped. Be happy this development isn’t planned for 1601 Locust!